FREDERICK SNOW BRYANT was the son of William M and Mary Eliza (Emery) Bryant, born in Kennebunkport [Descriptive Roll] on 4 Apr 1831 [Kennebunk VR]. He died in Kennebunk, Maine on 6 June 1906, aged 75 yrs, 2 mos, 4 das, from heart disease [ME death rec]. He was buried in Evergreen Cemetery, Kennebunk. He was married first, on 14 May 1854 in Boston, MA [MA vr], to ELLEN P STEDMAN. She was born ca 1839, the daughter of Albert Stedman. She died in Boston on 22 Apr 1857 from consumption, at age 18 yrs, 8 mos. Her burial place is not yet known. He secondly married, on 23 Aug 1859, to ELIZABETH FRANCES "FANNY" GILMAN, the daughter of Simon and Elizabeth Gilman. She was born in Westbrook, Maine [MA death rec; 1860 census says Biddeford] abt May 1837 (based on age at death). She died from lung congestion in Cambridge, MA on 13 Feb 1875 [MA death rec], aged 37 yrs, 9 mos. 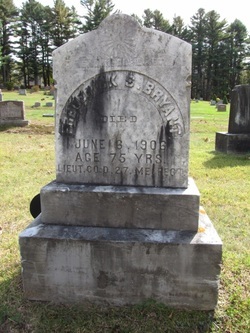 Fred was married a third time, to ANNIE J HOGAN, probably in 1875 [MA vr lists the marriage date as 12 Oct 1895 in Brookline, MA, but is surely an error]. She was born in St Johns, Newfoundland circa 1855 [per census recs], and was alive in 1920 census, living with son Horace in Somerville, MA. I. LEWIS EDWARD BRYANT, born 1856 [grave; 1900 census says Jan 1857] in Kennebunk [MA marr rec]; d. in 1924 [gravestone], and buried in Evergreen Cemetery, Kennebunk. He was married first to MAGGIE E JACKSON, dau of Benjamin and Margaret, on 15 Feb 1881 in Fall River, MA [MA marr rec]. She died in 1893, and is buried in Evergreen Cemetery. He secondly married, on 20 Nov 1899 in Kennebunkport [ME vr], to ADDIE C STONE. She was b. ca Nov 1854 [1900 census] in Kennebunkport [ME marr rec]; d. unk. She is buried in Evergreen Cemetery. II. FLORENCE ESTELLE BRYANT, b. 6 Apr 1864 in Kennebunkport, ME [MA birth rec - reported from Chelsea, MA]; d. 16 Dec 1943 in Farmington, NH [NH death rec]. She married, on 16 Nov 1886 in Rochester, NH [NH marr rec], to WESLEY I NUTTER. The son of Stephen and Sarah Nutter,he was born in Farmington, NH. III. HARRY H BRYANT, b. 18 Feb 1867 in Milford, MA [MA VR v.197 p.114]; d. 29 May 1926. He is buried in the Arundel Cemetery, Kennebunkport [YCCI, pg 121]. He and his older brother Lewis returned to Kennebunkport following the death of his mother, and lived with their Aunt Louisa D (Bryant) Jeffery. IV. ORVILLE DEWEY JOSEPH BRYANT, b. 16 Dec 1878 in Cambridge, MA [MA VR v.296 p.80]; d. in 1945 [grave]. He married, on 27 Nov 1912 in Boston, Ma [MA marr rec], to EMELINE G TIRRELL, the daughter of Joseph P and Kathryn M (Kelley) Tirrell. Both are buried in Elmlawn Cemetery in Kenmore (Tonawanda), New York, where they had moved prior to the 1930 census. V. FREDERICK W BRYANT, b. 2 Apr 1880 in Cambridge [MA birth rec]; died there 12 July 1880, aged 3 mos 10 das [MA death rec]. VI. GENEVA GERTRUDE BRYANT, b. 31 Mar 1881 in Boston [MA vr]; d. 7 July 1883 in Cambridge [MA death rec] from convulsions and teething, aged 2 yrs, 3 mos, 7 das. She was buried in Cambridge, MA. VII. LEANDER BRYANT, b. 9 Feb 1883 in Boston, MA [MA VR v.342 p.174]. He was living in Somerville, MA in 1918 [WWI Draft Reg Card]. VIII. RALPH BRYANT, b. 2 Apr 1885 in Boston [MA birth rec]; d. 17 Dec 1893 in Boston [MA vr]. IX. HORACE PACKARD BRYANT, b. 26 Sept 1886 in Boston, MA [MA birth rec]; d. 22 Dec 1934 in West Newton, MA.